Dr Lee Leing is our Family General Dentist who cares for both adults and children. Known for her gentle touch and for being thorough, she has helped many dental phobic patients allay and overcome anxiety over dental treatment. She works closely with visiting Anesthetists to offer Sedation Dentistry as an option. Driven by a simple philosophy- Treat every patient with empathy, compassion and professionalism, Dr Lee ensures that her patients understand their dental needs and treatment options before embarking on any treatment plan. In 2001, Dr Lee graduated from National University of Singapore, with a Bachelor of Dental Surgery degree. During her undergraduate years, she received the Reuben Meyer Scholarship, was in the Dean’s list and was awarded the Terrell Silver Medal for being the top student in Fixed Prosthodontics. After graduating, Dr Lee spent several years in the public sector, gaining experience in the primary and tertiary care setting while she worked at National Healthcare Group, National Dental Centre, and Alexandra Hospital. 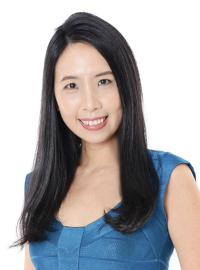 She was the Head of NHG Dentalcare Toa Payoh Clinic (2008-2011) before leaving to join Raffles Dental (2011-2018), where she assumed leadership and management positions – Physician Leader of Raffles Hospital (GP division), Head of Clinical Affairs Committee and served on the Clinical Audit Committee. Throughout her career, Dr Lee has actively mentored numerous junior dentists, helping them gain confidence and equipped them with the skills to succeed. In addition to mentoring junior dentists, she has also conducted training for dental assistants. To satisfy her curiosity and wanderlust, Dr Lee enjoys discovering new places, often seeking out interesting locales. Apart from traveling, she spends her time on Latin ballroom dancing and reading. At home, she’s a mum to a teenage son and daughter. Being animal lovers, they share their home with 3 furry bunnies. Book your appointment with Dr Lee Leing today!